The Great Pacific Garbage Patch bobs in the central North Pacific, trapped by rotating ocean currents. It is one of five such patches in the world’s oceans, and consists primarily of microscopic particles, mostly plastic, suspended in the upper water column. Indeed, more than 5 trillion plastic pieces weighing more than 250,000 tons are afloat at sea, according to an article published in the December 2014 PLOS ONE. Fish ingest these particles. And then we eat the fish. “Fish love to eat plastic, and that’s a problem,” says Dana Hunnes, a dietitian at the Ronald Reagan UCLA Medical Center. 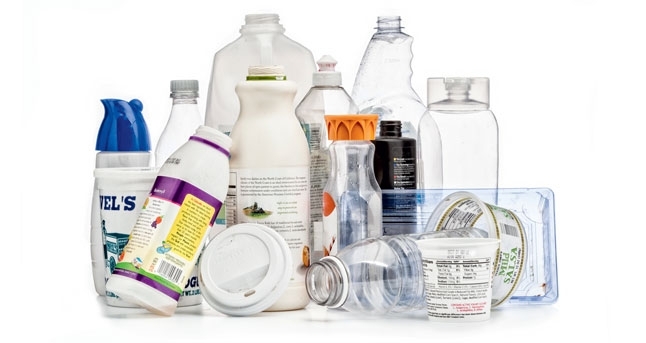 Writing in the Huffington Post, Hunnes notes that microscopic bits of plastic are ubiquitous. They are in our food, in our beverages — “they’re everywhere,” she says, including the far-reaches of the oceans. Hunnes cites a statistic from the United Nations Environment Programme that says 30 percent of all fish have plastic in them. It’s almost certain that most fish (and in fact, most marine animals) have chemical byproducts from plastic in their blood stream and stored in their fat, where the material accumulates in the fish and is passed up the food chain – eventually to us. Here’s how the plastic progression works: Small marine species feed on micro-plastic bits (much smaller than pearls) thinking they’re food. These bits can come from micro-beads in soaps and other cosmetic products, and from larger pieces of plastic that have been ripped apart by ocean currents. Larger fish and marine animals then dine on the smaller fish. First, reduce your use of plastic. Store food in glass or stainless steel as much as possible. Skip the plastic lid on a single-use coffee cup too. Better yet, bring your own reusable cup. You may even get a discount. Try to buy jarred vegetables instead of canned to avoid the BPA-filled lining. Limit your contact with thermal receipts (cash-register receipts contain BPA). None of these tips can hurt, and they might make the oceans – and ourselves – healthier.